Let’s Celebrate Public Works, Infrastructure, and Drinking Water! May is the month that public works and water utilities receive some much deserved recognition for the services they provide. Consider celebrating Drinking Water Week, Infrastructure Week, and Public Works Week because they provide great opportunities to spotlight the important work cities and utilities do year round. This year, Drinking Water Week falls on May 7-13, Infrastructure Week is May 15-19, and Public Works Week will be observed the week of May 21-27. We know everyone is busy serving their customers, but here are a few simple things you can do on your social media sites to celebrate the utility services you provide. Announce Drinking Water Week and post a photo of the local water treatment plant. Invite the community or schools to an open house at the water treatment plant and provide tours to show the treatment process. Serve ice water with snacks so attendees can sample the water being produced at the facility. Remember to post photos of the event and thank people for attending! Post an illustration that shows the water treatment process at your facility. Post the average number of gallons of H2O used by your water customers each day, month, or year. Share water conservation tips to help customers reduce their water bills. Post a photo from inside water treatment plant with the number of gallons the plant is capable of producing daily. Post a group photo of the water treatment plant staff, thanking them for their hard work. Announce Infrastructure Week and thank residents for supporting infrastructure projects. Thank the legislature for financial support of important infrastructure projects that benefit your community's drinking water, wastewater, and stormwater infrastructure, or projects that will benefit roads, bridges, and airports. Post a photo of an infrastructure project that is under construction with an explanation of how it will benefit residents. Post a construction photo of previously constructed large infrastructure projects in your community with fun facts such as "Did you know ___ number of vehicles travel over the bridge or on this stretch of road each day?" Announce Public Works Week and list all of the services Public Works provide to residents. Invite community to any events being held in honor of Public Works Week and post photos from the event. Some cities host an open house with refreshments, tours of facilities, and put their large equipment on display for people to see up close. Post a photo of a garbage or recycling truck picking up trash with a fact about how much trash the solid waste crews pick up weekly, monthly, or annually. Post a photo of street crews at work with a fact about the number miles of roads in the city. Post a photo from inside water treatment plant with a fact about the city’s average daily water use or the plant’s daily capacity. Post a photo from inside the wastewater plant with a fact about how much waste the plant handles daily, monthly, or annually. Post a group photo of Public Works staff, thanking them for their hard work. The American Water Works Association (AWWA) has lots of public outreach materials on its website, from draft news releases to official Water Week logos. Use the official hashtag #DrinkingWaterWeek17 or create one specific to your city or water utility for all of your social media posts during Drinking Water Week. Several organizations come together to promote Infrastructure Week, which has its own website. Use the hashtag #TimeToBuild to link your social media posts to other Infrastructure Week posts online. The American Public Works Association (APWA) website has a toolkit that includes suggestions for activities to celebrate Public Works Week. 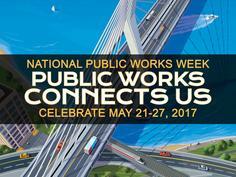 Use the hashtag #NPWW in your posts to denote National Public Works Week or make up an original hashtag for your City or utility.